I don't know if there's anything more boring to eat than a chicken breast. 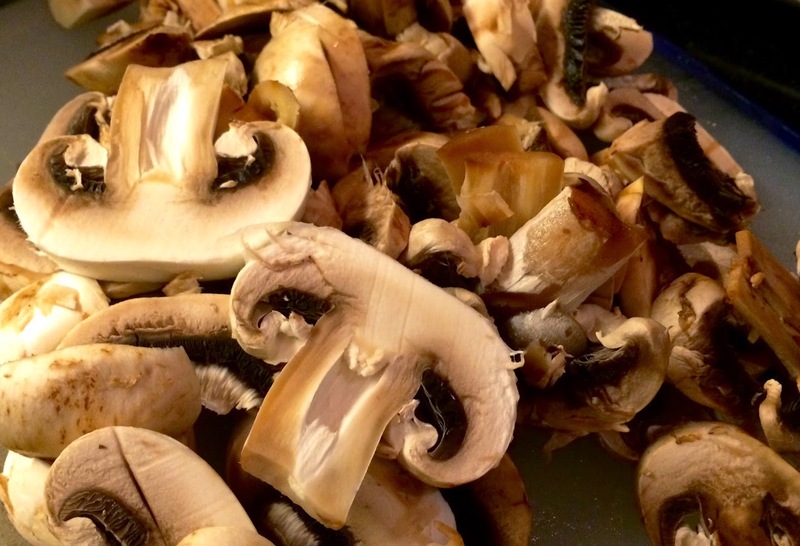 The worst of them can be cooked until they are as dry as a board or smothered in cheese and mushroom soup until they are unrecognizable. Ugh. But, they aren't that bad. I will admit that a juicy, barbecued chicken breast covered in a sticky-sweet sauce and charred on the grill is one of life's simple pleasures. I guess you could say chicken breasts are like tilapia. Bland yet versatile -- which is great for inventive cookery. Still, you probably won't hear cheers and applause when you say "chicken breasts" when asked the inevitable, "What's for dinner?" Slice the chicken lengthwise into strips, then cut the strips into bite-size pieces. Place in a large bowl. In a smaller bowl, whisk together 3 TBS of the soy sauce, the cornstarch and sugar, along with 1 TBS of the ginger and 1/3 of the minced garlic. Add the soy sauce mixture to the chicken, until coated. Cover the bowl and place in the fridge to marinate for at least 15 minutes. 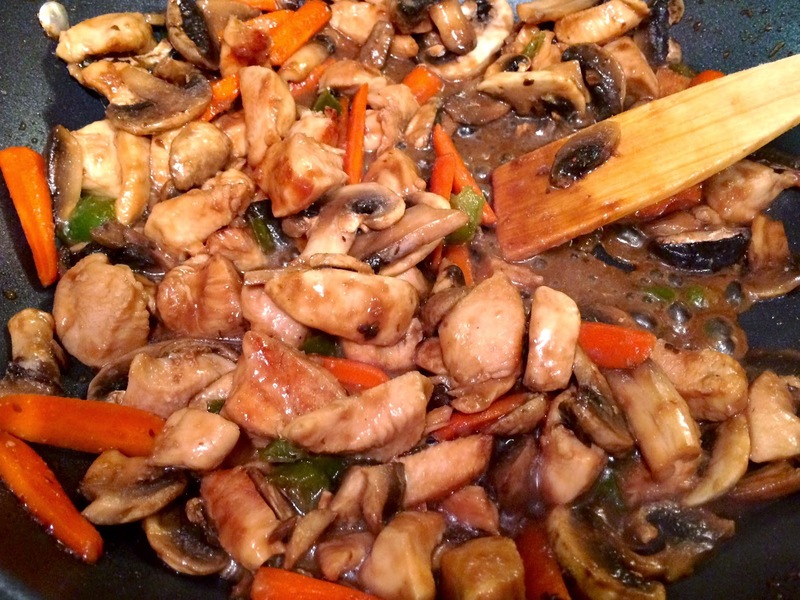 While the chicken is marinating, slice up the mushrooms and carrots and set aside. In a large wok or skillet with rounded sides, heat the vegetable oil over medium-high heat. When the oil shimmers, carefully add the chicken and the marinade and stir frequently, until browned. Use a slotted spoon to transfer the chicken to a clean bowl, keeping the juices in the hot pan. Add the remaining garlic and ginger to the pan and cook until softened and fragrant. Stir in the carrots and cook until tender-crisp, then add in the peppers, mushrooms and the last TBS of soy sauce. Cook about 5 minutes more. Return the chicken to the pan and reduce the heat to low. Season with salt/pepper and mix in the sesame oil, pepper flakes, and sesame seeds, then cover the pan and let it simmer about 10 minutes or until sauce has thickened. 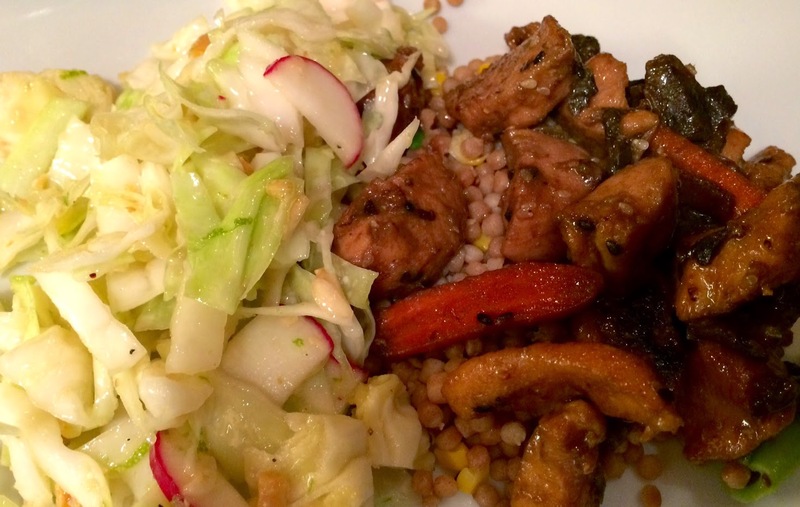 Serve over brown rice or couscous. Clean the radishes, then remove the tops/roots and cut in half. Slice into thin half moon pieces. 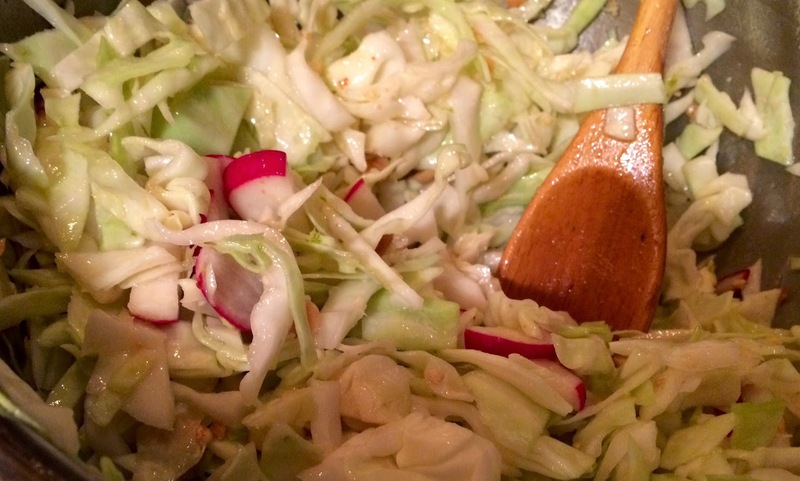 Place the cabbage and radishes in a large salad bowl. In a medium-sized bowl, whisk together the oil, vinegar, ginger, garlic powder, sesame oil, lime juice, honey and miso. Pour over cabbage and radishes and toss. Season with salt, then add the peanuts, cilantro and lime zest. Give it another quick toss, and serve. It's even better when it's had some time to marinate. Garlicky is a great name and a better dish! What's the best garlic dish you have ever had at a restaurant? Put it on your Besty List Petite Gourmess! :) This even has "lime zest" yum yum yum and lots of fun!